Add these Mini Swiss Cheese Tartlets to your next appetizer menu. 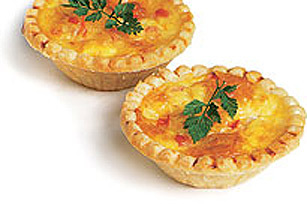 Mini pastry shells are filled with ham, tomatoes and Swiss cheese for our take on bite-size quiches. COMBINE 1/3 cup milk with 3 eggs and a handful of grated Kraft Swiss Cheese. Set aside. FILL unbaked mini tart shells with a few spoonfuls each of chopped ham and tomatoes. FILL each shell to the top with egg mixture. Bake at 400°F for 20 minutes.